GIS can be a valuable tool for improving park access. The Trust for Public Land ParkScore Project measures how well US cities are meeting the need for parks. Built with ArcGIS, ParkScore is a free tool that empowers both individuals and city leaders to improve park systems. The 40 largest cities in the United States each have their own character and personality. But one thing that they all have in common is the need for a great park system. Some cities are well on their way to achieving this goal, but others have a great deal of work to do. Parks are important to communities because nearby opportunities to exercise and experience nature are essential for physical and mental well-being. Studies show that parks can encourage physical activity, revitalize local economies, and help bring neighborhoods together. 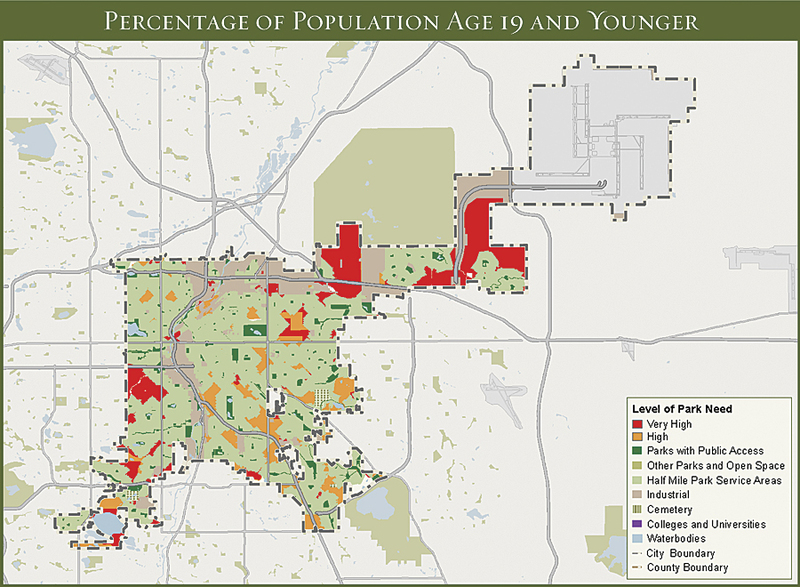 This ParkScore map illustrates the level of park need for Denver's children and adolescents by showing the areas of the city with and without park access. This is why the Trust for Public Land ParkScore Project was developed. ParkScore is the most comprehensive park rating system ever developed and measures, on a scale of 0 to 100, how well cities are meeting the need for parks. The ParkScore website, ParkScore.TPL.org, is free and fully accessible to all. The goal is to empower communities to put more parks on the ground. ParkScore serves two categories of users. The first consists of individuals and families. The website provides residents with a quick and easy way of seeing their city’s park system in detail and allows them to compare their city with others across the United States. This will provide users with both a national perspective on their local park access and the tools to advocate for park improvements in their communities. This kind of information is exactly what is needed to support comprehensive park system improvement programs. The ArcGIS mapping technology used for this project identifies which neighborhoods and demographics are underserved by parks and how many people are able to reach a park within a 10-minute walk. The Trust for Public Land selected ArcGIS technology because it provides a robust set of tools and applications for detailed park system analyses and, since it is used by most local governments, allows an easy exchange of information. The ArcGIS platform was also selected because it allowed the creation of walking networks, providing a model for how people walk from their homes and other locations to parks and showing how park access can be increased. City leaders, such as San Diego mayor Jerry Sanders, are already embracing ParkScore. San Diego’s park system ranked 8th among the 40 largest US cities. 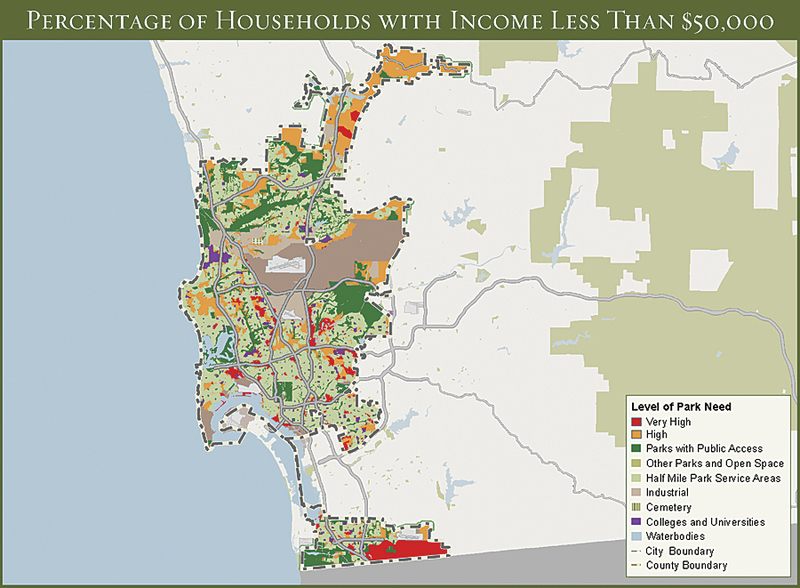 The level of park need in San Diego for those with a household income of less than $50,000 is illustrated by showing the areas of the city with and without park access. The website’s ability to offer city leaders a series of solutions and next steps for how to fill the gaps in local park systems that were identified by ParkScore analysis fits in with the Trust for Public Land’s four primary services: analyzing local landscapes and identifying where there are gaps in park access, securing funding for land transactions, executing land transactions, and designing and developing parkland once it has been secured. Breece Robertson and Bob Heuer are with the Trust for Public Land. Robertson is the national director of conservation vision and GIS. She joined the organization in 2001 to create a comprehensive, coordinated GIS program. Heuer is the associate GIS director for the Trust for Public Land. He manages the GIS analysis for ParkScore, as well as a variety of other projects. For more information, contact Breece Robertson, the Trust for Public Land, or visit ParkScore.TPL.org.